Clyde Farris is a baby boomer of the early fifties who was born in Philadelphia, Pennsylvania. His family moved to nearby Yeadon, PA when he was very young and he attended elementary, middle, and high school there. After graduating in 1972, Clyde attended what was then Virginia State College near Petersburg, Virginia. He graduated in 1977 with a degree in music education. Clyde worked briefly as an instrumental music teacher at the middle and high school level before leaving to market securities and insurance. His career also included stints as a heavy equipment operator, stockbroker, and business owner. Most recently Clyde has worked as a sales representative for a foreign auto manufacturer. As a musician, Clyde performed for ten years with the Petersburg Symphony, the Johnny Peyton Renaissance Band, and other local groups. He has also shared his talents with numerous churches and theatrical productions in the Richmond/Petersburg areas. Clyde has always been concerned about the plight of black males. He mentored a young man who had lost both parents at an early age by becoming a Big Brother in the 1980’s. His little brother Wayne is now in his forties. Clyde also mentored his nephew and niece when they were very young. His desire has always been to give to those in need. In 2007, Clyde answered a divine call by starting a broadcasting career. He enjoys talk radio and has appeared in Richmond on 1540AM, on Love Broadcasting an internet radio station for two years, on 1140WRVA, and on 990WLEE. Clyde plans to do more radio and TV as he begins to promote his book. 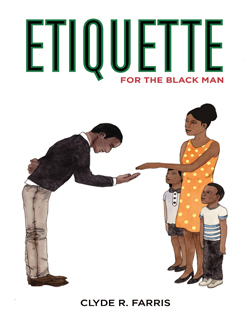 He wants Etiquette for the Black Man to make a difference in the lives of black men across America.